Have you ever wondered what it would be like to be a baby bird, nestled deep inside your nest, staring up at the passing blue sky and bright sun? And then to have parent birds fly down, towards your gaping beak, as they arrive head-first. What a view from your circular world, built of moss, leaves and twigs, cradled in the branches of a towering tree. This is the feeling I sought to convey in From Inside The Raven’s Nest, the outer dark edges of the nest circular and open to the rising morning sun and pale blue sky. I was inspired to do this painting earlier this week, while watching ravens somersault through the blue, their groaking filling the valley in which I live. If you call out to them, they do answer. 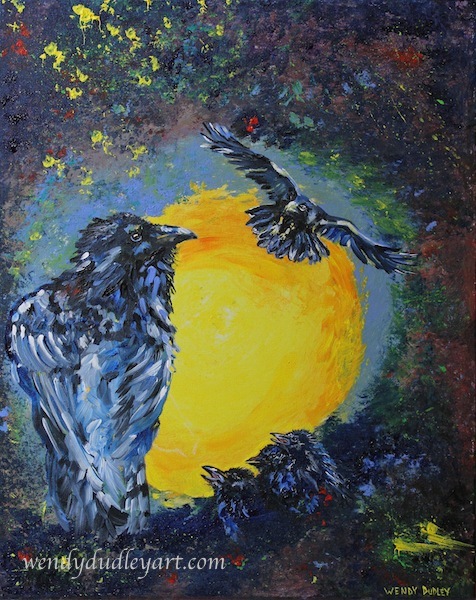 This entry was posted in About the Work, Musings and tagged bird, nest, raven, Wendy Dudley, Wendy Dudley art, Wendy Dudley painting, wildlife on April 8, 2016 by Wendy. The red tails are back! Walking the dogs this morning, the sky suddenly split with the shriek of my favourite hawk, the red-tailed. Last spring, they nested in my valley and I grew accustomed to their day-long cries until late autumn. Reaching the open meadow, I spotted the pair, circling above the high hill to the north, at times their wing tips almost touching. Their call is so distinctive, deeper and of a sounder pitch than the weaker imitation by the blue jays that have been playing the hawk-mock trick outside my kitchen window for the past week. 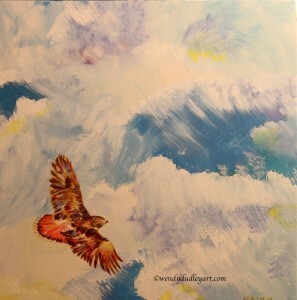 The hawk’s call cuts to my core, taking me over the hills, viewing the world from such an expansive perspective. Oh, to soar on the hot afternoon thermals, and to view things in the big picture. 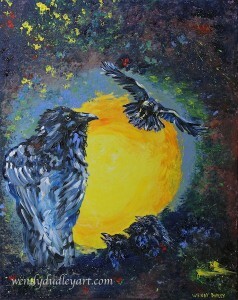 Later today, I watched a pair of ravens drift in the afternoon breeze over my barn. I called, and they answered. They circled back, looking down. And then I heard the wind of powerful wings. From the open field came the red-tailed, diving down on the raven. They disappeared behind the spruce tops. And then the hawk circled back, and, once again, in full throttle, sliced the air with its speed towards the black birds. Minutes later, I heard the ravens’ distant groaks, and then the pair of hawks once again returned, wheeling and wheeling. For now, they own this space in the sky. This entry was posted in About the Work, Musings and tagged art, hawk, painting, red tailed hawk, Wendy Dudley, wildlife on April 7, 2016 by Wendy. For some reason, we as a species find it necessary to label, categorize and to define within boxes. I work hard not to do this. I prefer to exist as is, defined more by my life experiences and natural evolution as I move along the life spectrum. And so, when it comes to beliefs, I cannot tell you what I am in a single word. As in an animist, a pantheist, a Buddhist, a Christian, or a pagan? I can only share my beliefs, and let them stand as is. I express myself through my words and art, so within each you will find a blend, a meeting of diverse wisdoms, a coming together of various stories, whether told by the skies, the ancients or medicine souls. What I can say is that I am attracted to the primal. As in the Old Age, which of course is carried into the new age by those who apply the teachings of the past. 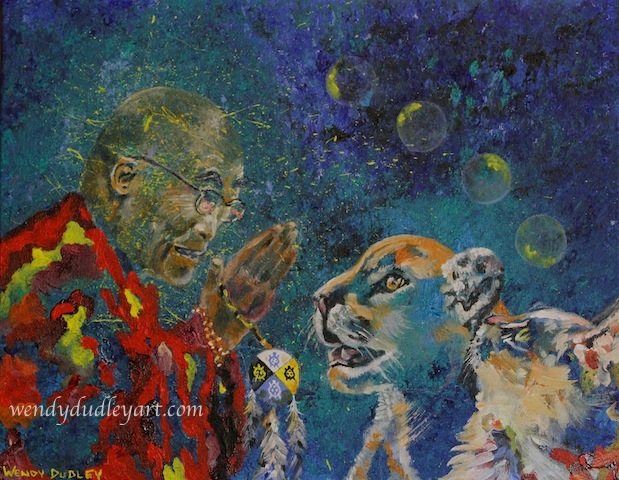 So while the Dalai Lama sharing a canvas with Turtle Island, shamanism, transformation, and the celestial may be to some a curious combination, it actually tells the story of how different beliefs share a common path. We may come from different directions, but we all seek a compassionate destination. This entry was posted in About the Work and tagged cougar, Dalai Lama, mystical, painting, shamanistic, Wendy Dudley on April 7, 2016 by Wendy.